This is Book One in The Kentucky Brothers Series. It is called The Journey. Titus has a twin brother name Timothy who has already settled in Kentucky. Titus’ girlfriend, Phoebe, had plans of her own, and they were NOT to stay in Pennsylvania and marry Titus. She wanted to travel, and far, all the way to California. She had a girlfriend of hers, also Amish, who had the same dream she did. Phoebe breaks up with Titus, breaking his heart beyond repair, and she moves to California. In the meantime, a family friend, Allen Walters, comes through Lancaster, Pennsylvania, on his way to Kentucky. Titus takes him up on his offer to let him ride along to Kentucky with him to relocate and help him get over Phoebe. Allen even knows of a job available for Titus in construction. Off he moves to Kentucky, and he will be living near his twin brother Timothy. This does not make his own mother very happy, but Titus is of age, and a baptized member of the church, entirely able to make his own decisions about his life. When he reaches Kentucky, he meets a woman named Suzanne, who looks so much like Phoebe; he pushes her away from him. Little does he know how right they could be if they were together. A running joke among Suzanne’s family and friends is she cannot cook no matter what she does. She would much rather be out in the barn doing the families woodworking business than cooking. She also loves to fish. Both things that Titus loves to do. There is also a woman named Esther. Suzanne pushes Esther to date Titus, but they seem like an unlikely match. We don’t know who Titus picks until the end of this story. There is no way to even guess at who dates who. The author does throw a good wrench into the story in which she brings Phoebe to Kentucky to visit Titus. She has a change of heart after her girlfriend moves back to Pennsylvania and Phoebe is left by herself in California. She decides to move back as well, but to stop and see Titus in Kentucky first, assuming he will take her back immediately. Does he? Or does he choose to date Suzanne or Esther? 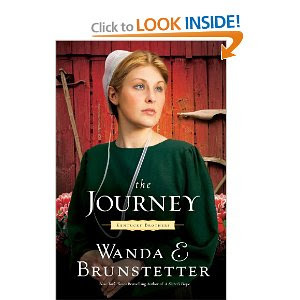 I used to really like Wanda E. Brunstetter, but lately, I feel as if her books are to predictable. You can guess ahead of time what is going to happen, how the storyline will play out, even who the characters choose to marry. I am starting to get a little tired of reading her books. Book 3 of The Kentucky Brothers is called “The Struggle”, due out in October, but we are past that and it is still up for preorder at Amazon. Hmmm? At least this book was a nice escape from the realities of life, at least, as are all of the Amish books Wanda E Brunstetter writes. Book Two I have already read, so, yes, I read them out of order, but I have done a review on that one as well, called “The Healing”. Just from the name of the third book in this series, “The Struggle”, makes it sound interesting, so I will most likely read that one as well, and finish off this series, whenever it becomes available. I can never start a series and NOT finish it! I know she has just written a new book which is NOT an Amish book, but a book of 3 MODERN Romance stories, called “Love Finds a Way, 3 Modern Romances Make Falling in Love Simple and Sweet”, due out January 3rd, 2012. She missed the Christmas mark? This book is most likely available for pre-order. I don’t know if this has the Amish woven into this series of books or not? The last words of the name of the book are Simple and Sweet, so maybe it might be Amish? I honestly don’t know. Perhaps she is getting a little tired of writing the Amish books as well? I’m not sure. She also has a new series of Amish books called “Sisters of Holmes County Omnibus”. From reading at Amazon, evidently she wrote those while she was writing The Kentucky Brothers Series. I received this book for “FREE” from Barbour Books, through NetGalley, through their Book Reviewer’s Program in exchange to read and write a review about this book. It is NOT required for my review I write to be either positive or negative, but, “of my own opinion.” I was NOT provided with “ANY” monies to accept this book, “NOR” to read it, NOR were “ANY” monies given to me to write the review for this book. All that was ‘expected’ of me was to enjoy the pure pleasure of reading it. Again, the opinions expressed for and about this book are ‘of my own opinion’. I am disclosing this information in accordance with the Federal Trade Commission’s 16 CFR, Part 255, http://www.access.gpo.gov/nara/cfr/waisidx_03/16cfr255_03.html Guides Concerning the Use of Endorsements and Testimonials in Advertising. You can purchase all 3 of these books by clicking on the photos to the left side below! It'll take you directly to the Amazon page! Think Christmas presents!